Soon after the credits rolled on Cloverfield, Matt Reeves’ found footage monster movie that stomped into theaters almost a decade ago, moviegoers were left to mull over a whole host of mind-boggling questions. Where did the alien creature come from? Did it survive the Hammer Down protocol? And just what on Earth does all this have to do with sushi? And though many of those questions and queries remain unanswered to this day, director Dan Trachtenberg and J.J. Abrams crafted a peculiar, yet fiercely compelling extension of the Cloverfield universe last year in the form of 10 Cloverfield Lane. For a movie that entered production under the codename Valencia, with a minute budget of $15 million, Paramount’s standalone pic proved to be a runaway success, and it’s given the studio the impetus to craft a full-blown universe of loosely connected anthology movies. 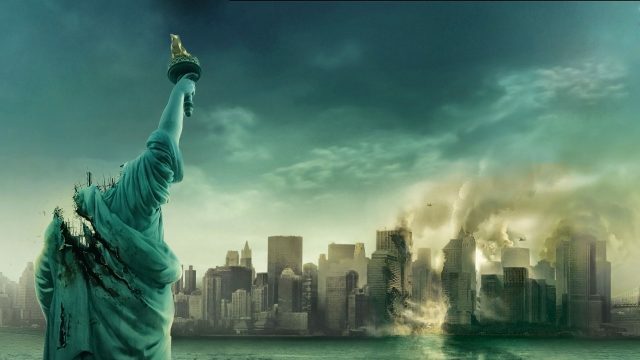 Next up is Cloverfield 3, the star-studded space movie that began life as God Particle. Headed up by director Julius Onah, the 2017 pic has spent the past 12 months recruiting a host of top-tier talent – namely David Oyelowo, Gugu Mbatha-Raw, Daniel Brühl, Chris O’Dowd, Ziyi Zhang, and Elizabeth Debicki – and it was only late last year when Paramount made the news official: God Particle has been Cloverfield 3 all along. Mind you, that isn’t strictly speaking the case. As screenwriter Oren Uziel reveals to Collider, God Particle existed as its own separate entity for years before it was woven into the Cloverfield universe. It was written before 10 Cloverfield Lane and the expanded Cloverfield universe even existed as a thing. It was a spec that I wrote probably a year or so after Shimmer Lake, so it definitely existed as its own science-fiction. And then after years of, you know how scripts kind of hang around—people like them but for whatever reason they decided to make it and then suddenly everything fell into place with J.J. [Abrams], Bad Robot, and Paramount. I don’t know exactly when it became a Cloverfield movie, but I suspect in this current market where it’s just harder and harder to market an original movie of any kind, a science-fiction movie in particular, but I think everyone just knew if it fits—and it does—into that Cloverfield world, it should, and it can only help. And though Uziel acknowledges that God Particle was altered ever so slightly, the scribe stressed that the film’s core story, one of a crew of astronauts dealing with a potentially apocalyptic calamity in space, remained the same. We rewrote during production, but I’m not sure what it means to be part of the expanded Cloverfield universe, other than knowing what kind of quality and feel you’re gonna get from something that’s coming out of Bad Robot and J.J. It just sort of helps to give an understanding of like, ‘Okay I understand what type of movie this is gonna be.’ As far as specifics, I don’t think there is one specific thread that makes it a Cloverfield movie, I guess. It’s all part of J.J. Abrams and Paramount’s strategy to foster a shared universe of anthology movies, which continues to be all the rage in Hollywood. But the Cloververse is more in line with The Twilight Zone than, say, the Marvel Cinematic Universe. I think if you can get that off the ground, which they are close, it’s very smart and also great for makers of science-fiction because it relieves you of that burden of like, ‘How are we gonna get people to get off their asses and into the movie theater to see something they’re not sure?’ It’s not a guarantee; the cast is different, we don’t know exactly what we’re getting, but if that stamp of approval of being part of the Cloverfield universe is enough, that’s a huge win. So I’m all for it. When you turn on The Twilight Zone, that’s sort of the way I think about it. I don’t know what this story is going to be, but I know it’s going to be a Twilight Zone story… It’s like an anthology for those kinds of movies, and I think if J.J., if what he’s doing is positioning himself a little bit to be the Rod Serling of J.J.-type science-fiction movies, more power to him. God Particle Paramount and Bad Robot’s Untitled Cloverfield Movie has been penciled in for release on October 27th, a launch date it currently shares with horror reboot/franchise revival, Saw: Legacy.